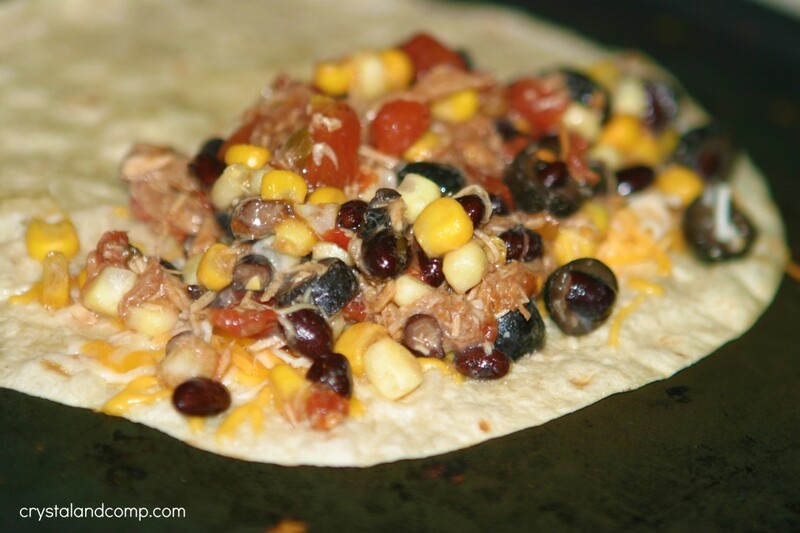 Ready for another easy recipe that is perfect for using up leftover meat? I used pulled pork that my SIL made at a recent cookout we had. 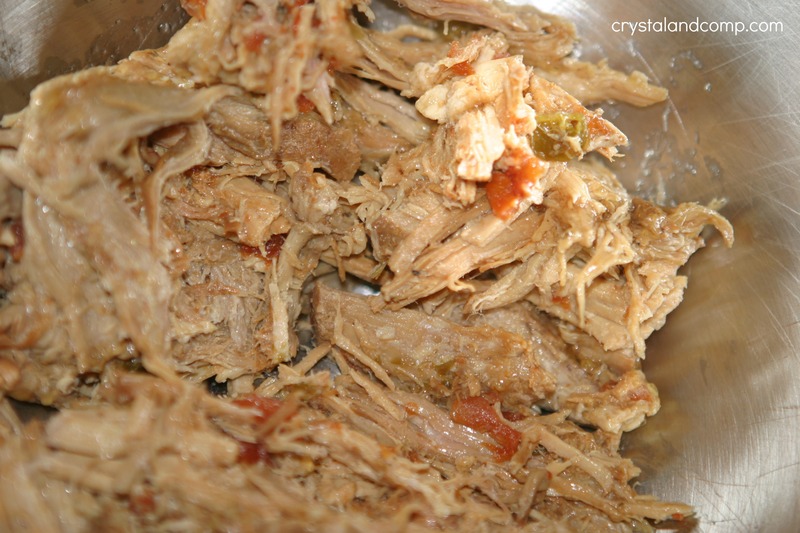 I will share her pulled pork recipe soon- very tasty. 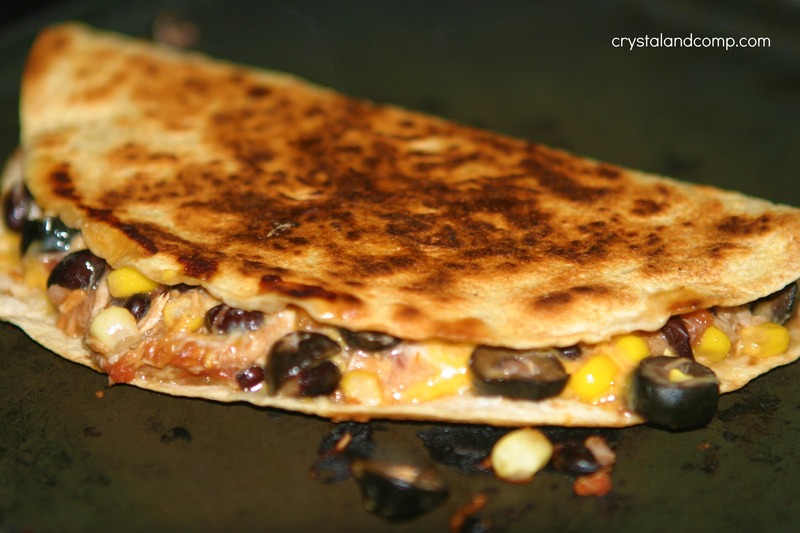 Most of the time when I make these quesadillas I am using leftover chicken from a previous dinner. 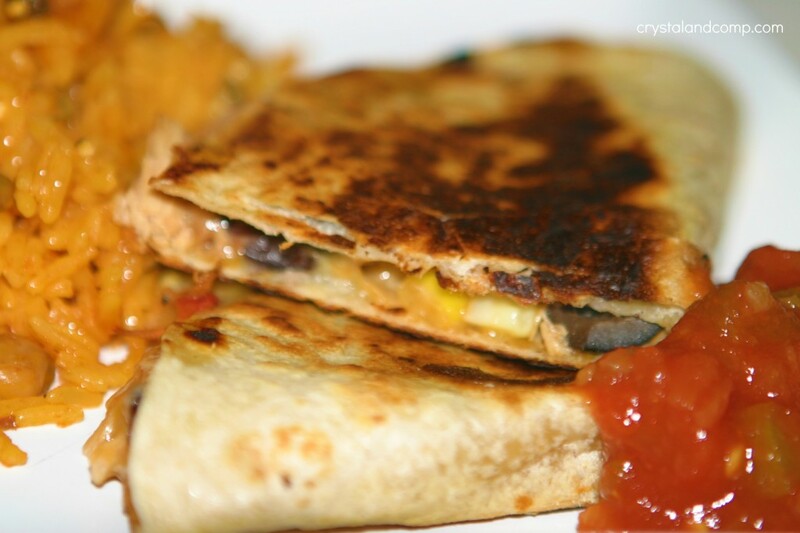 These quesadillas come together very quickly and this is another awesome 30 minute meal that is perfect for a busy school night. You can also go vegetarian and opt out of the meat. The black beans are full of protein. garnish with optional items like: salsa, sour cream, guacamole, etc. In a large bowl add your shredded or diced cooked meat. In this case we are using pulled pork. 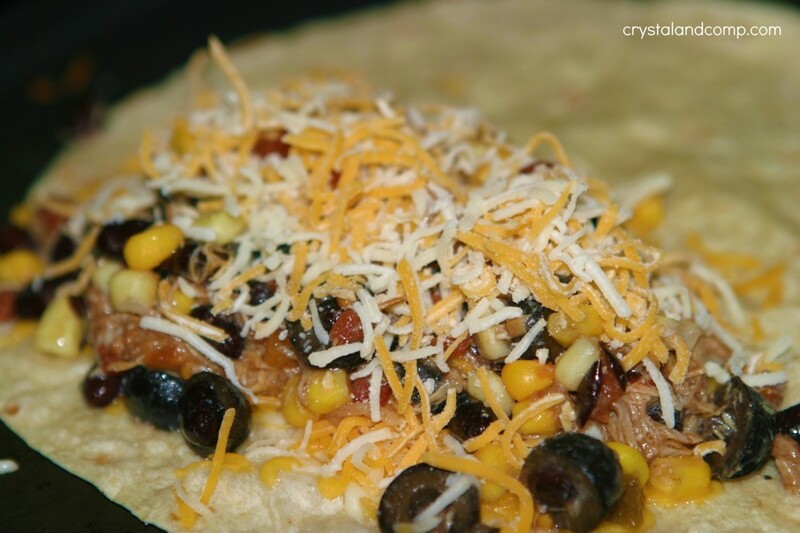 Toss in the black beans, corn, Rotel and sliced olives. Place one flour tortilla on a griddle over medium heat. On half of the tortilla add a bit of shredded cheese. When the cheese melts, this is what helps the tortilla stay sealed. Add a couple of spoonfuls of the meat and bean mixture on top of the cheese. Add a bit more shredded cheese on top of the meat mixture. 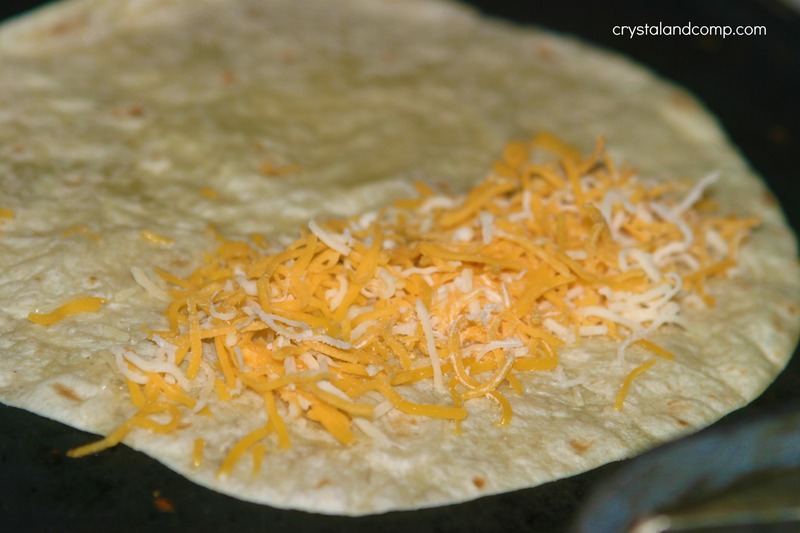 Notice, you are only using one half of the tortilla for your cheese and meat mixture. 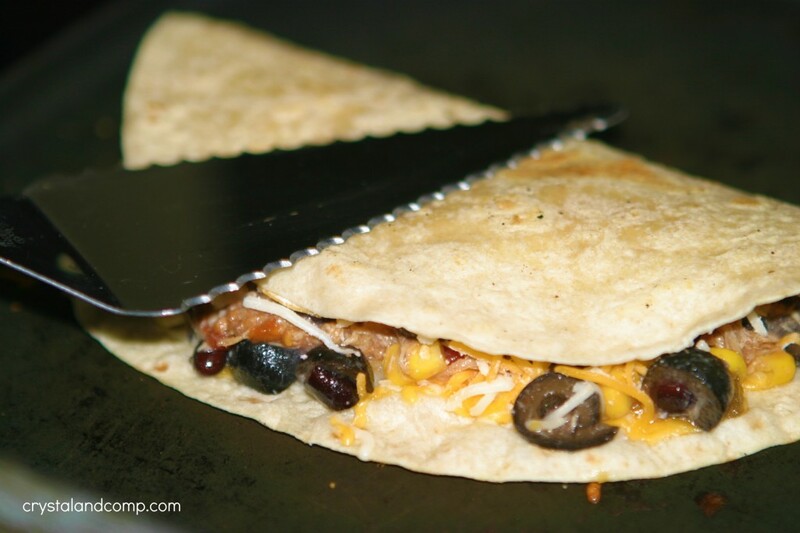 Fold the top of the tortilla over and press down with a spatula (or pie slicer… just go with it). As the cheese melts it will secure the tortilla closed. Cook on each side for about 3-5 minutes until the tortilla is lightly brown. Serve with rice and garnish with salsa, sour cream and guacamole. This is the perfect meal for a busy school or work night. For more easy recipes, check out my recipe index. 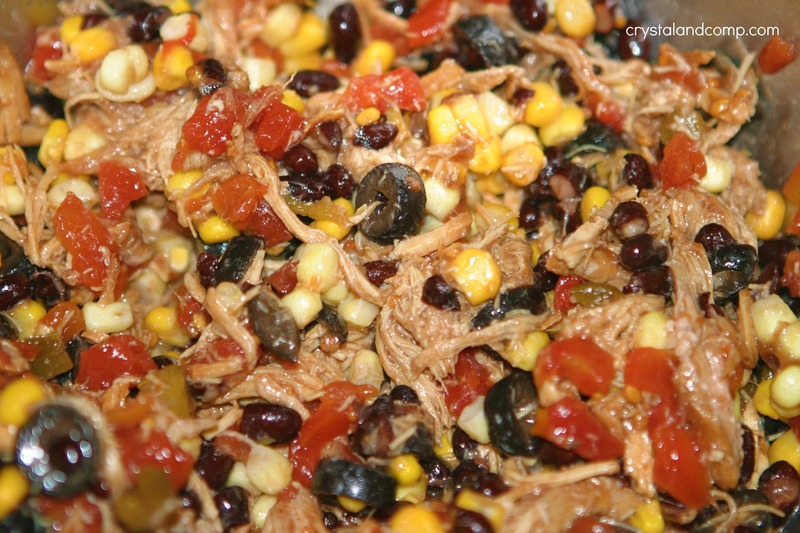 In a large bowl add your shredded or diced cooked meat. In this case we are using pulled pork. Toss in the black beans, corn, Rotel and sliced olives. Stir until combined. Thanks for this great recipe. I’ll be trying it soon! If you promisse it’s easy, I’ll give it a try this weekend. It really looks supremely delicious, yummmy! It really is so easy, Victoria. You’re just mixing everything up and throwing it on a griddle. Medium heat (or lower to play it safe) is important to prevent burning. OH my word, these are right up my alley, they look scrumptious! Quesadillas are our standard Sunday afternoon meal-although yours looks a lot tastier. Tara- these are really easy and a great way to use up leftover meat! Give them a try. Yum! Such a quick easy nutritious meal that I never thought of making. Please share this on my foodie friday party and I will pin it too. Hey Crystal! I’m right there with you in the mexican flavor department. My family loves my tacos and quesadillas, but I had forgotten corn! Awesome addition! OMG. You’re hilarious – and things like that happen in my kitchen all the time too! Thanks for the recipe, and all the pictures! 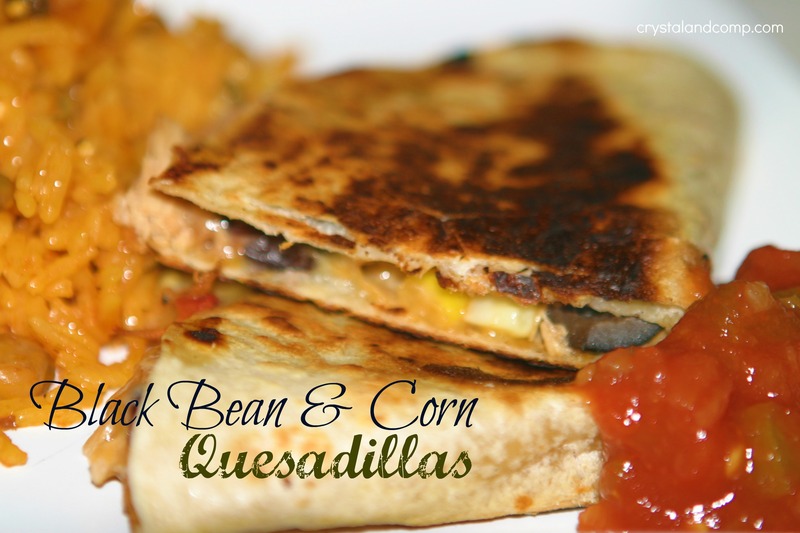 We LOVE quesadillas, but I’ve always been too intimidated to try them at home. You’ve given me the guts to try it, and they’re on the menu tonight! Ali recently posted..DIY Night: Homemade Baby Food Sweet Potatoes! Ali- hope your family enjoys them!